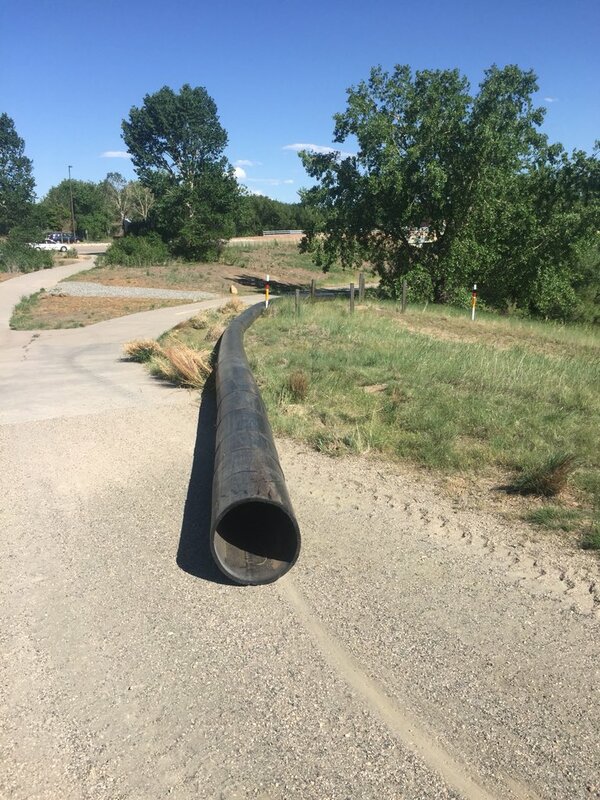 An extended closure of Sand Creek Greenway of up to eight weeks (between Chambers and Airport through Star K Ranch) is necessary for the replacement of sanitary pipe by Aurora Water. As soon as we know the actual dates of closure, we’ll post them here and share them through social media. Our thanks to the staff of Aurora Parks, Recreation & Open Space for keeping the Morrison Nature Center and the Wetland Loop trail open to the public during this lengthy closure. The new temporary crusher fines surface has been put down! We have also learned that a long-planned project to construct a water quality pond has started. It is located just west of the Central Park Boulevard bridge. When needed to accommodate construction, a detour will be constructed for trail users. 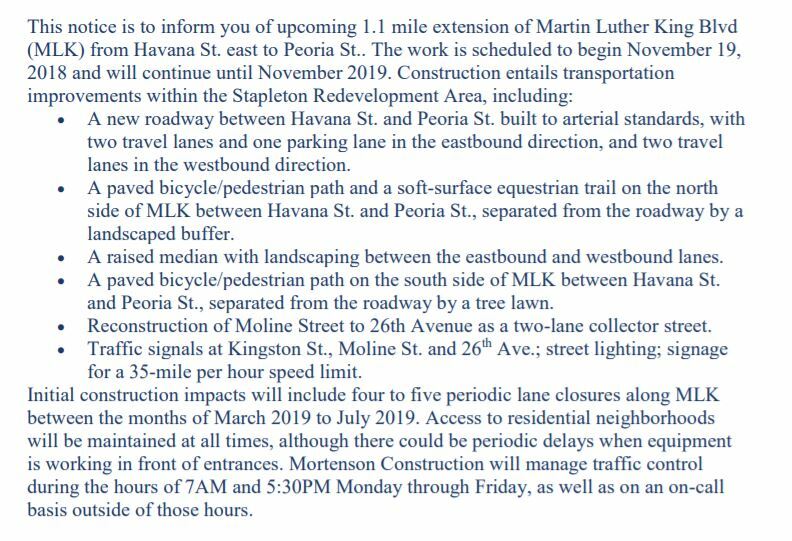 Our friends at Mortenson alerted us that during the week of December 10, there will be some construction under Peoria at the border between Aurora and Denver on our Greenway to install a storm main. This is the area affected. Mortenson tells us the trail will not be closed during this time, and will provide a way for bicyclists and other trail users to get around the construction. As the Martin Luther King Blvd project moves into high gear, there’s good news for long-term improvement of our Greenway between Bluff Lake Nature Center and the border (under Peoria Ave.) between Denver and Aurora. Here’s a summary of the work to be done, from Mortenson. Our friends at Mortenson alerted us there may be construction activity on the Denver portion of the Greenway on November 12, as they repair some limited areas of trail surface near the Central Park Blvd bridge. The trail will NOT be closed, but it may be flagged and there may be very minor detours while work is taking place. Another alert for the Central Park Blvd bridge area in the Denver portion of our Greenway. We were informed that a concrete pump set up on the trail on 7/16/18 under the bridge deck at Central Park Blvd and the Greenway. The pump will be in place from 2:00am – 2:00pm. Flaggers will be on site stopping trail users until it is safe for them to cross. Thanks to our friends at Mortenson for advance notice of this trail delay! AURORA: (June 1) we just heard of a closure at Airport Road, the result of utility work, and we’re trying to learn more about this and how long the trail might be closed. Stay tuned and check our social media channels for updates. 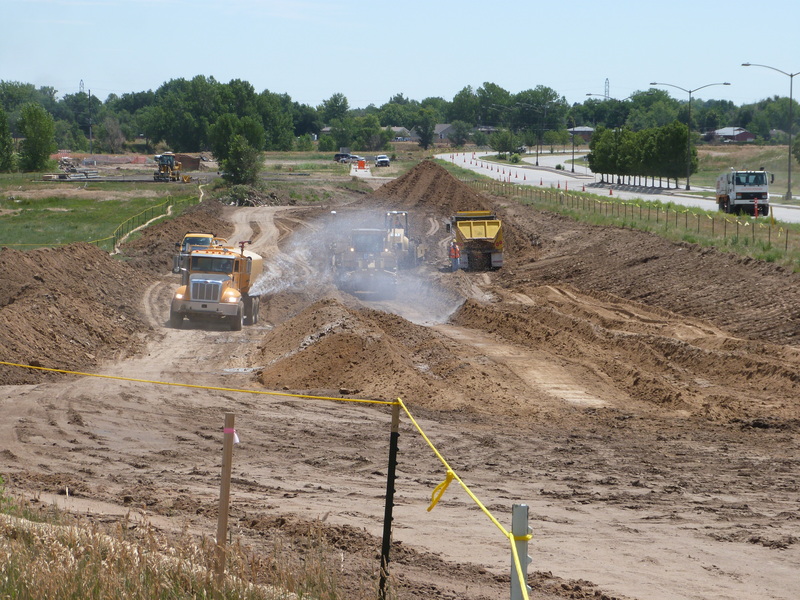 The western stretch of our Sand Creek Greenway in Commerce City is now paved and fully open! Landscaping work will continue in that area, but the trail is open and it is beautiful! 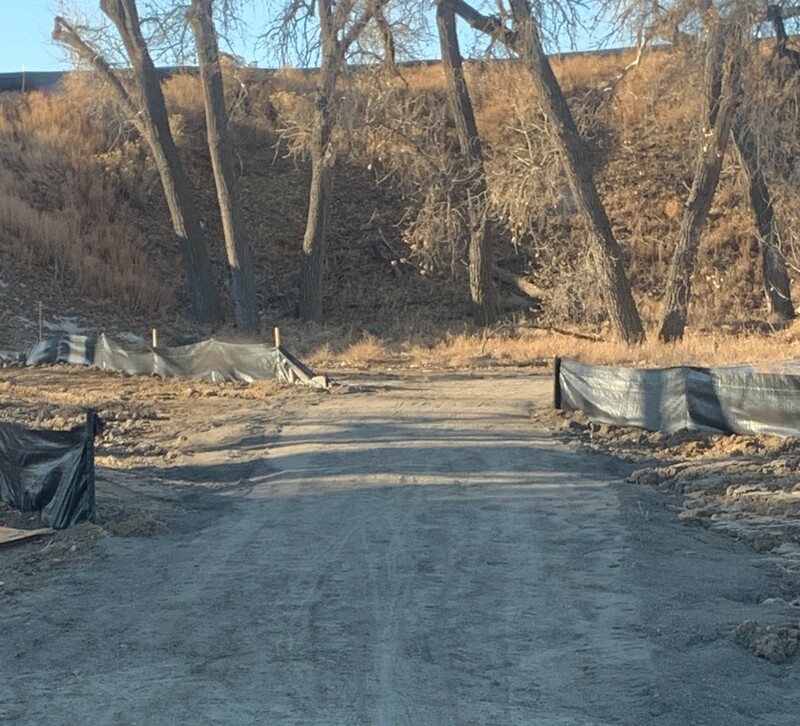 Hearty thanks to our friends in the Parks and Recreation Department of Commerce City for their vision and hard work making this important enhancement to the Sand Creek Greenway. Now it is even easier getting to the South Platte! Notice of temporary Greenway closure and a good story about cooperation: Monday, February 19, our Sand Creek Greenway will be closed at the Central Park Blvd bridge going over the trail from 8 pm to 5 am, in order to start construction on a new bridge. 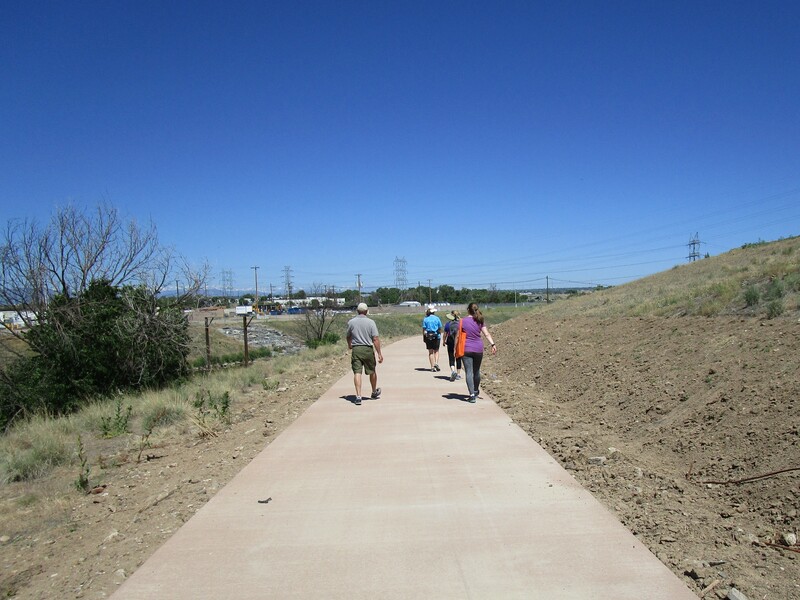 Representatives from Denver Parks and Recreation, Mortensen Construction, Inc. Kraemer North America and our Sand Creek Regional Greenway Partnership met yesterday to form a plan to accommodate construction schedule needs, but limit impact to trail users and to the riparian areas near the bridge. The end result to trail users: the trail will be closed for (very) limited number of nights starting at 8 pm over a several month period, and these nights will be posted on trail signs and on social media. (so stay tuned) This will avoid lengthy and unattractive trail detours during that time. In addition, there may be very short delays of less than 10 minutes during very limited periods. This will protect trail users, while keeping the Greenway open as much as possible. We thank our friends and partners at Denver Parks and Recreation, and new friends at Mortenson Construction and Kraemer North America for their cooperation on this important matter. We know our Greenway is a place for recreation, but it is also a way many of you get to work each day. Knowing ahead of time is critical for you. By working together, we can get this new bridge built and keep our Greenway open! Thanks to all for this great cooperative effort! 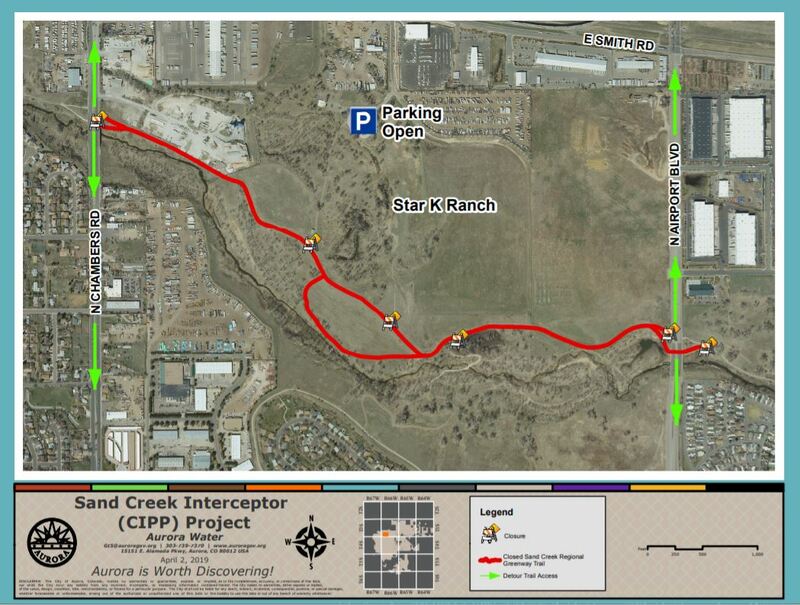 Map of affected area, please note: our trail is misnamed as “Colorado Front Range Trail” in this image. 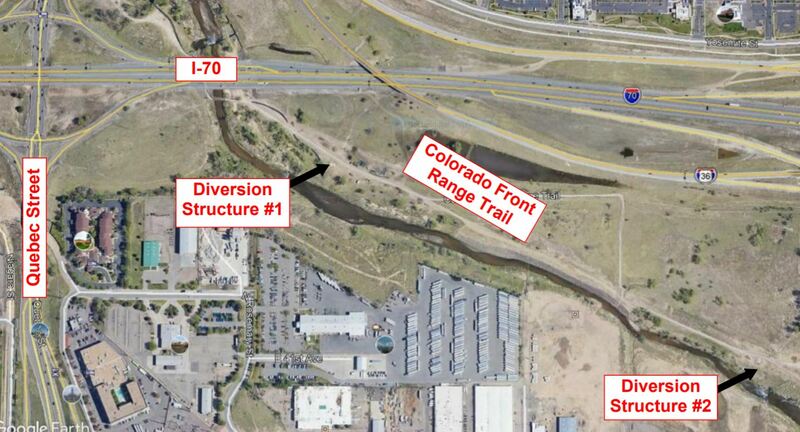 Starting 4/9 for about a month in Denver, there will be trucks near the trail–but not blocking the trail–south of I-70 and east of Quebec. Work will begin on two “diversion structures,” commonly known as manholes or drainage structures. Insituform will be performing work on the drainage structures in the area. RTD has COMPLETED several new FastTrack lines and the trails are now OPEN! AURORA: The trails north of Fitzsimons Parkway are open. The new Aurora R Line is running and all the trails in Sand Creek Park that were previously closed due to this construction are OPEN! COMMERCE CITY: The N Line to Thornton is under construction. 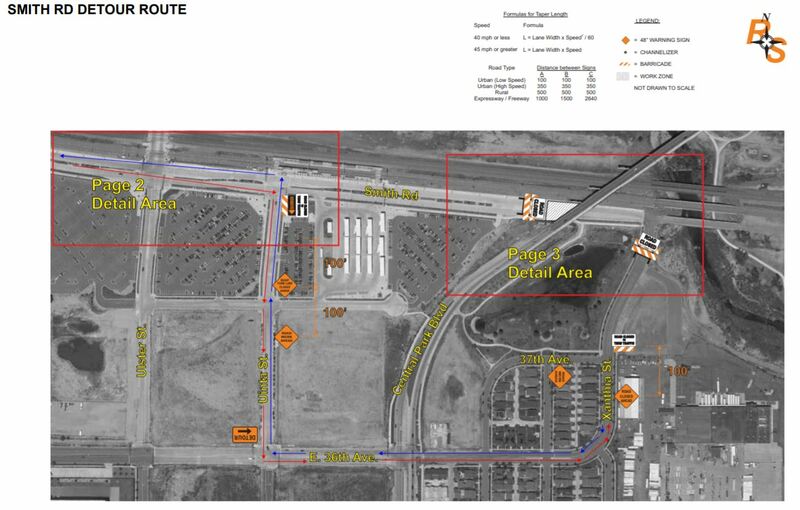 Detours will be in place approximately .5 miles west of 64th Ave and Colorado Blvd (east of the Sand Creek confluence with the South Platte River along the O’Brian Canal) in Commerce City. Please follow all posted signs and speed limits. Thank you! DENVER: The A Line to Denver International Airport is OPEN! 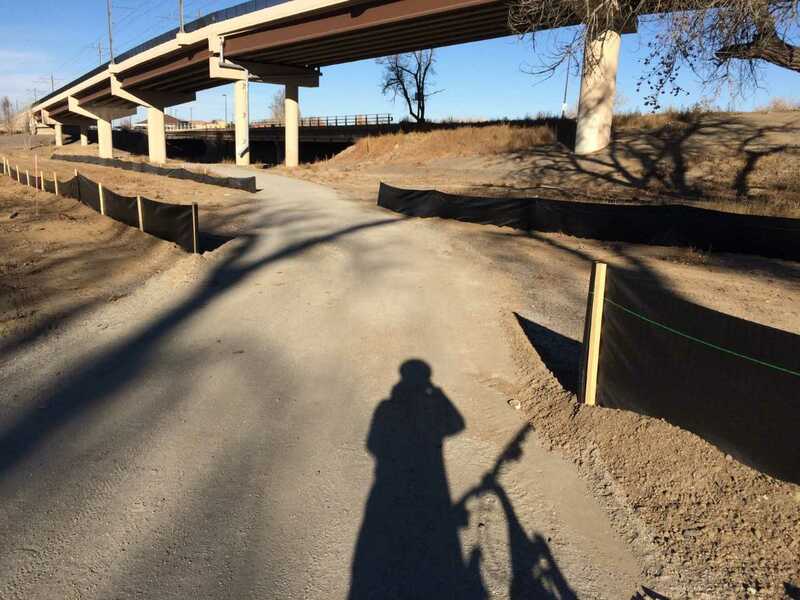 The paved trail under the A Line and two Union Pacific railroad bridges is OPEN! Enjoy the ride! 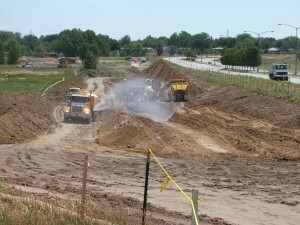 Construction is underway in the Beeler Park neighborhood east of Dicks Sporting Good Park. A DETOUR to the Arsenal Connector Trail will be in place during construction. The detour runs through the Dicks Sporting Goods complex. Click here to view a map of the detour. Trail users are our eyes and ears on the Greenway. 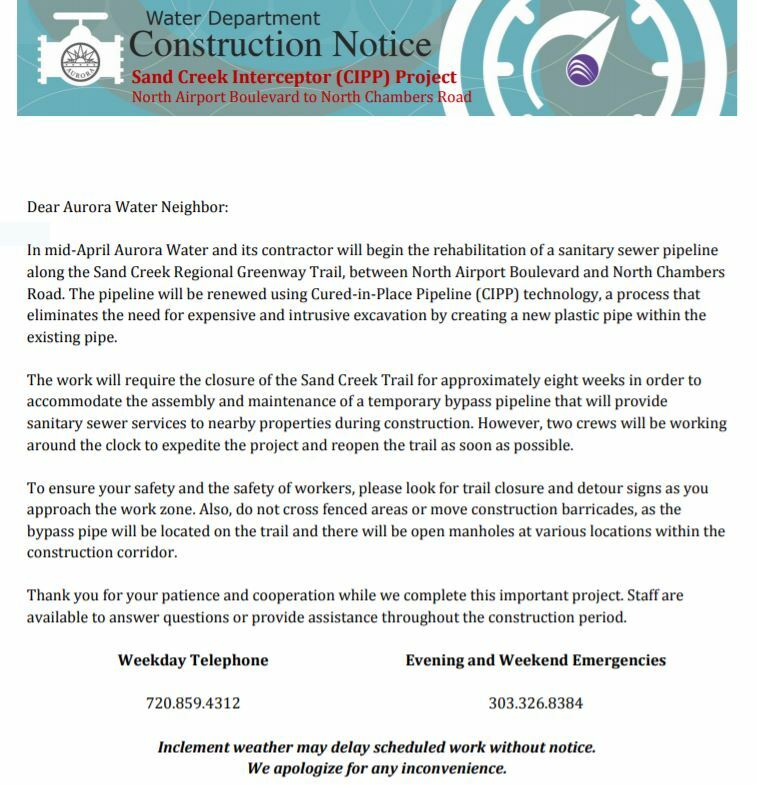 Please call us at (303) 468-3263 or send an email to bnobles@sandcreekgreenway.org if you have any issues, problems, or solutions. We love to hearing from you!